Integrating Acuity with MailChimp allows you to directly connect Acuity appointments and your bulk email lists. Note: If you are in the European Union, you should enable double opt-in to ensure General Data Protection Regulation compliance. Note: It’s important that you make sure your list follows MailChimp’s rules. Be sure to read MailChimp’s Guidelines for List Compliance. Scroll down to the Email Marketing section. Click on the Set Up button below MailChimp. Enter your MailChimp API in the field that appears. In the first dropdown, select the MailChimp list to which you want new Acuity clients added. In the second dropdown, select the question you created in the first step. Each new appointment will sync the client’s name, last appointment date and last appointment type to MailChimp. Go to Appointments > Import/Export. Click Export Client List. Acuity will export your client list to your device as a .csv file. Import the .csv file to a list in MailChimp. MailChimp lists can be set to require single opt-in or double opt-in. Single opt-in: Clients who answer “Yes” to your opt-in question are added to your mailing list. Double opt-in: Clients who answer “Yes” to your opt-in question are sent a confirmation email. Those who confirm are then added to the list. Click here to control this setting in MailChimp. If you are in the EU, we strongly recommend you use double opt-in. Did the clients click “Yes” on your opt-in question? If your client books through the Client Scheduling Page, they must check this box to be added to the list. If you’re booking for them from the admin side, you must check the box for them. To do this, click on the Forms, Codes and Notes section during scheduling. Are your clients confirming that they’ve opted in to your mailing list? If you have double opt-in enabled and you don’t see clients on your MailChimp list, it’s likely that they didn’t confirm their opt-in. You can choose whether your MailChimp list uses single or double opt-in in MailChimp. Choose an Acuity trigger, such as New Appointment. Add a filter or trigger question. Choose your MailChimp action. 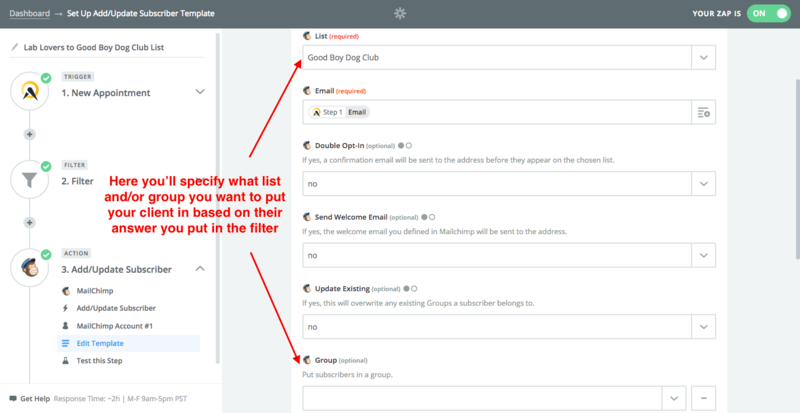 Make sure to specify which list and group those from the filter go to.